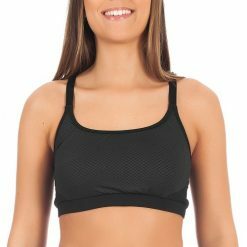 Julião sports bra is reversible and can be used on both sides. One side is smooth in vibrant colors, and the other side is in exclusive butterflies prints. Julião sports bra is reversible and can be used on both sides. One side is smooth in vibrant colors, and the other side is in exclusive butterflies prints. Its elastic cross-back straps and chest band are customized, providing complete freedom of movement and extreme comfort during the sports activities.